We are just one day away from Thanksgiving– one day hooray! Thank you to YOU! Thank you for reading these posts and enjoying the recipes & baking. I am forever thankful & grateful for you. Exactly one year ago today, I blogged about a Chocolate Bourbon Pecan pie. A fully delicious, luscious, pie. Today’s pie is just as fabulous, but this time, it’s dairy-free!!! With Thanksgiving fast approaching tomorrow, it’s officially pie time. YES. Pie. Probably my favorite food-part of Thanksgiving. Well that and stuffing. Oh and turkey. And wine. Ok ok, I want it all. But pie is a must! 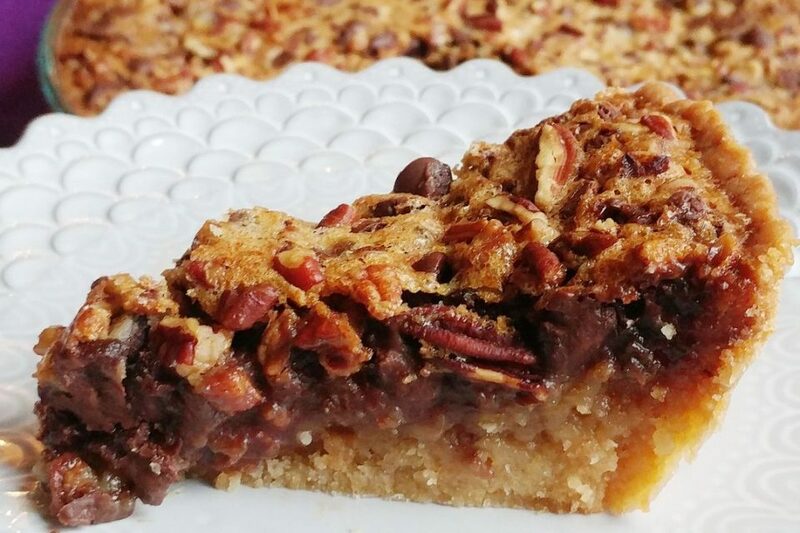 If you like chocolate & pecans, this pie is right up your alley. And if you like bourbon, it is REALLY in your wheelhouse. You should know that you can taste the bourbon in the pie. If you like bourbon, you will love it. If you don’t like bourbon, no worries! 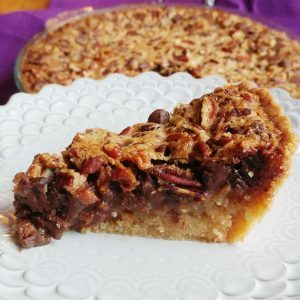 Just leave it out of the recipe below, and you’ll have a beautiful chocolate pecan pie! Anyway! I’m all about the bourbon, so, let’s get to our boozy baking! Makes one 9 inch pie. About 8-10 servings. 1) Preheat your oven to 350 degrees F. Spray a 9-inch pie plate with non-stick cooking spray. If you have a deep-dish pie plate, go ahead and use it! 2) In a large bowl, sift together the flour, corn starch, powdered sugar, and salt. Then, mix in the melted coconut oil. It’ll form a dough. 3) Press the crust dough into your pie plate. Don’t be shy– feel free to use your hands! If you don’t want to get your hands dirty, you can use the flat bottom of a cup– that works well too. This makes a thick crust. Because the crust is DELISH. After you press it into the plate, use a fork to prick some holes in the crust. This will help to make sure you dont get any air pockets. 4) Bake the crust in the 350 degree oven for 20 minutes. 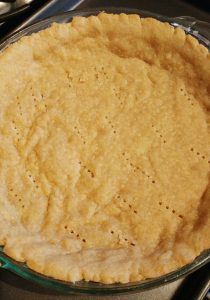 6) Once your arms are tired and the mixture is fully incorporated, your crust will probably be almost done! When it is, remove it from the oven. 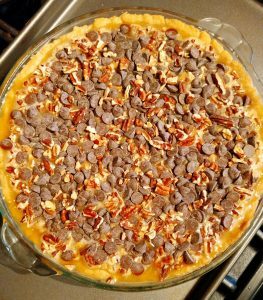 Turn the oven temp down to 325 degrees F.
7) Sprinkle about half of the chocolate chips over the crust. 8) Pour the egg mixture over the chocolate chip studded crust. Then, sprinkle the pecans and remaining chocolate chips on top. Lightly press them into the custardy mixture to make sure they’re snugged in there. 9) Bake the pie in the 325 degree oven for about 1 hour. I put the pie on a baking sheet just in case there are any drips. You don’t want it dripping into your oven because the drips would burn and smoke and your pie would be ruined!! So, use the baking sheet. 10) It’s done when the whole thing is a beautiful golden brown color and the edges are bubbly. The middle will still jiggle. That’s ok. It’ll set when it cools. 11) Place the pie on a hot mitt or wire cooling rack to cool. 12) The pie is easiest to cut when it’s cold; however, it’s unmatched when eaten warm. 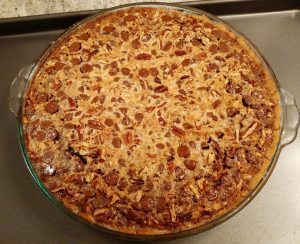 If you’re going for the look and want to be neat, cool the pie completely and refrigerate it for a few hours before cutting into it. OR, if you are OK with a gooey pie, you can serve it warm! Want to go crazy? Put a scoop of dairy-free vanilla ice cream on top. 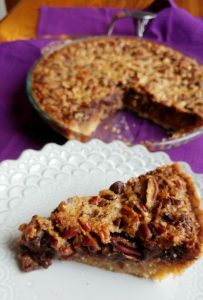 Warm, chocolaty gooey bourbony pie with the crunch of the pecans, topped with the cool refreshing vanilla ice cream. It’s a match that’s meant to be. Enjoy!!! I hope everyone at your Thanksgiving table loves this pie. As always when you’re baking, tag @thefetchingfoodie on Instagram! I can’t wait to see! Happy Thanksgiving to you and yours from me and mine. Enjoy the holiday, savor lots of delicious food, celebrate the quality family time!! I am Thankful for you! If you like bourbon in baking and you also want an apple pie, check out my bourbony apple pie recipe! Or, if you want the traditional, bourbon-less version of apple pie, click here!